Chilly, shortening fall nights and raw fields of corn stubble will always bring unbidden to my mind, 3 thoughts. One, that winter is not far away. Two, since winter is close at hand, Christmas is too! And three, (insert thrilled shiver), Halloween is just days away! Halloween and I have always had a strong interpersonal relationship. Costumes, masks, shrieks, candy, dim flashlights, laughter, the sound of running feet and chimes of doorbells even today makes me anticipate the Hallow's Eve. Growing up in a large community of story and a half Cape Cod homes (most purchased with the assistance of the GI Bill)...every house in my neighborhood had families with children. Most of our parents were about the same age...and so were the children. All four of us siblings had no shortage of playmates our respective ages. All four of us, with our warm clothes on under each costume, held pillowcases tightly in our hands. Jostling each other to gain advantage at each stoop, we called out "Trick or Treat" after firmly pressing doorbells. As doors opened, we would chorus again, "Trick or Treat!" Opening our pillowcases wide, we received a piece or two of candy. (Always hoping for the good stuff...not the peanut butter Mary Janes.) As a group we sang out our thank yous. The adults at the door would usually comment about our costumes or say hi to our parents standing off by the street. Dad hauled a wagon for us as we tired out. My brother asked to stay out later and join his friends, to leave us "little kids" behind. Mom had stayed home to man the candy bowl...so Dad told him not to get in any trouble and to be home in 1 hour. I remember masses of children in our circle of 60 houses...more than what our streets held during the daylight hours...running and screaming at each other. Boos and cackles sounded from all directions as goblins ran by. And upon arrival back home, we quickly shed our costumes. The four of us piled into the living room; telling Mom about who we saw...and what costumes were the greatest! We each sat down and dumped out our goody bags on the braided rug; hunting feverishly for our favorite candies. And if we scored a full size candy bar...holy mackerel! I remember sorting into 4 piles: shareable, all for myself, trade able and yuck. Mom allowed us 3 or 4 pieces then secured our haul in decorative tins...promising us we could make it last longer and would not get ill from being greedy. 1964 was my family's last Halloween in our little red house at 2259 Knoll Drive...it was also most of my friends' last Halloween in their homes too. May 5th 1965 the tornadoes hit our little pocket of innocence and safety...and scattered more than roofs and siding. My favorite adult Halloween was 1987...my first celebration in my own little house on the corner. 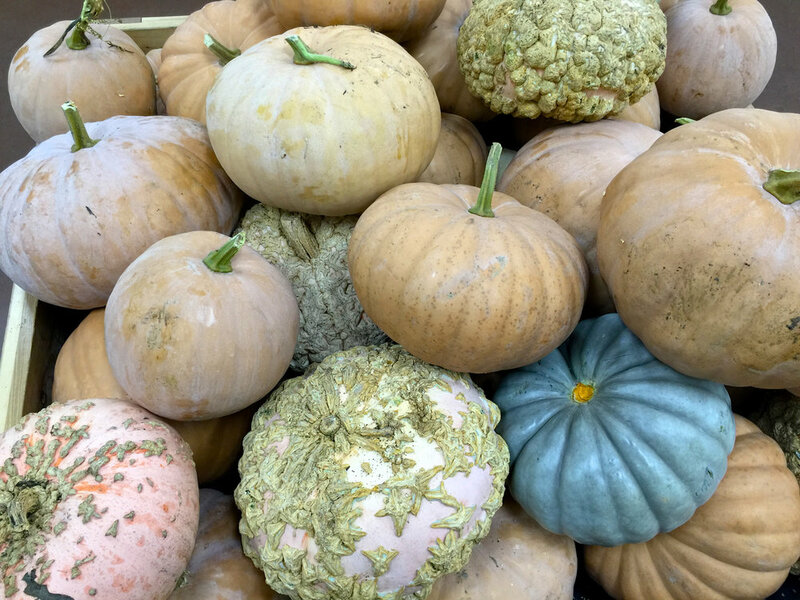 I had nervously purchased my pumpkins too early...and had to find more when I discovered my originals were rotted. I carved for 4 hours..making pumpkin masterpieces. (After already carving 5 pumpkins with my Dad at my parent's house) (We were rather pumpkin slap happy!) I hauled in cornstalks and hay bales. I removed the window from my screen door to make passing out candy easier. (Especially since opening my door would have cleared every child off the stoop...not to mention the pumpkins.) I hung spider web lights, had masses of candy and even put a cowboy hat on my dog Trooper. Dusk came. I could hear children's voices throughout the neighborhood. I saw costumed figures running down the sidewalks. But no knocks at my door. Nothing. I was crushed. I called my Dad crying. He was bewildered as I was. He told me to go outside and look around to see if something was wrong. Maybe people thought the house was still unoccupied as it had been for 4 years. So I walked around the side into the yard. A Dad was on the sidewalk with a Jedi and a Care Bear...going PAST my house. I called to him to bring his kids over so I could give them candy. He stopped under the street light. He looked at me. He looked at my house. "Oh...I thought you weren't home. Your light isn't on." I was so excited to "do" Halloween in my snug little abode that I never noticed that I hadn't turned on my front porch light. (Being on a corner lot, I was using my back door with its bigger landing as Halloween Central.) I had glowing pumpkins set to be seen from the side street...just not the front street. Talk about a lightbulb literally and figuratively going on. My least favorite Halloween was 1998. The year my Dad died. I found myself thinking about not "doing" Halloween. He wouldn't be with me to discuss the merits of each pumpkin selected at the Pumpkin Patch. Would this one make a good cat? Did I see that the really tall skinny one would be perfect to carve a snarly face? Who would help me gut, carve and create each pumpkin at my parent's house and mine? Who would race me to the first completed masterpiece? I finally went; Halloween being in 2 days. I walked the rows of pumpkins, gourds, Indian corn and hay bales. I missed his comments. "I found a perfect one!" His sneaking in the cart just one more pumpkin to carve, shrugging his shoulder as if to say "what is one more?" Pumpkins didn't talk to me that year. I blindly grabbed only 3, not even examining them for their merits. Loaded them in the Jeep. And then sat at the wheel and cried for 20 minutes. I put off carving until the last minute. Arriving at Mom's at 4pm on Halloween. Wanting to crawl in bed. Not wanting to be cheerful...or have fun...or make cutesy comments about happy children's costumes. My Mom was anxious. "Are you going to carve my pumpkins?" "Do we have candles?" "How many pieces of candy do I give out?" "When should I turn out the porch light?" At that point, I realized she was even more lost than I was. Halloween had always been Dad's and my holiday. We DID Halloween...Mom was just along for the ride. So I carved the pumpkins. No masterpieces that year. No witches flying passed harvest moons. No cats with arched backs and sharp teeth. No evil fangs nor crooked grins. But I did carve them. I have changed up the tradition of Halloween from what was to what it is now. I just close up my house...no small kids left in my neighborhood anyway. I go to my Moms to hand out the candy...but she is the one to ooh over costumes. I put up cobwebs and carve 4 or 5 pumpkins. Nothing as fancy as we used to do...but still one masterpiece in the bunch. And for Mom...one happy pumpkin face.